Like many of you, I began reading comics at a young age. In my case, it was the early 1980s at the time when Chris Claremont and John Romita Jr. were reinventing Uncanny X-Men, Walt Simonson was storming The Mighty Thor and Boisterous Bill Mantlo was penning a variety of titles simultaneously, including Micronauts, Peter Parker the Spectacular Spider-Man, Captain America, Rom and The Incredible Hulk. At such a young age, I was quite impressionable, and all the Marvel comics I enjoyed would make me into a fan for life. During these formative years, it would be Marvel comic books which played a major influence in developing my sense of honor and duty, expanding my vocabulary, defining what interpersonal relationships could be, and weaving my own fabric of morality. After 30+ years of reading comics by hundreds of storytellers, I can say without any hesitation that there could’ve been no better writer to help build my moral center than the Boisterous One. It would be during his run on The Incredible Hulk that I would learn key lessons about kindness, humility, forgiveness, love, heroism and sacrifice. They are lessons I carry with me to this day and which affect both my core beliefs and the way I act to those in the world around me. For nearly 300 single issues and annuals, the monster men call “Hulk” had ravaged the towns, cities and countrysides across the U.S. of A., as well as many other countries and foreign places. Sometimes he had been poked and prodded by the U.S. military, other times he leveled property galore fighting villains of all sorts, and sometimes he busted things up simply because he was feeling surly. 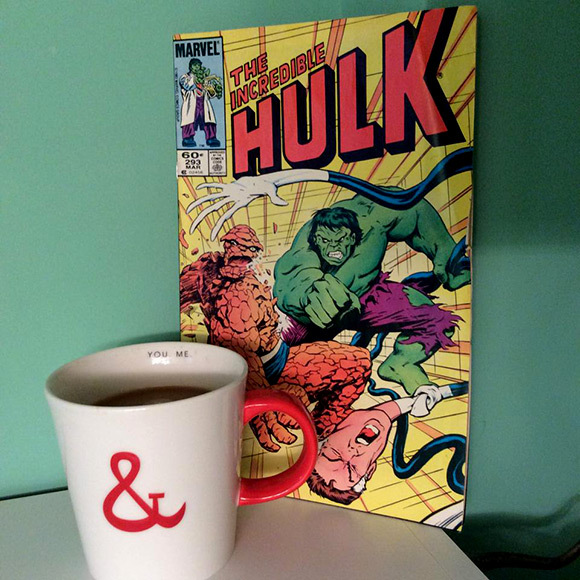 In any case, we readers followed the continuing adventures of the Hulk and his alter ego, Bruce Banner. The story didn’t show the aftermath of his rampages, the hardships faced by people whose lives he had upended, or the pain caused to anyone except those on the receiving end of Hulk’s mighty fists. But that was all before the miraculous occurred. After a series of incidents which exposed the Incredible Hulk to more and more doses of gamma radiation, Bruce Banner’s personality was able to assert itself to achieve dominance over the Hulk! Now, he can transform back and forth from a normal man to the Hulk at will, and his efforts to save the Earth and Washington, D.C. from catastrophic threats have even earned him a Presidential pardon! To the world at large, the Hulk is now a hero…a force for good…and a friend to mankind. However, it seems that not everyone holds warm and fuzzy feelings for the green goliath, no matter what the newspapers now say about him. Later, Bruce and Kate pay a visit to the Baxter Building, headquarters of the world famous Fantastic Four. Reed Richards has offered Banner the use of the lab facilities there to study a gamma energy surge detected in deep space. The F.F. no longer live in the Baxter Building, however, so with Ben Grimm -– a.k.a. The Thing – on his way out, Bruce and Kate have the run of the place. As they use Reed’s equipment to scan the suspicious sector of space, the gamma energy surge sends some sort of feedback straight at Earth, at the Baxter Building, and at the scientists themselves! It’s only Banner’s split-second reaction to transform into the Hulk and protect Kate from the ensuing blast that saves both of them from a explosive death. The next morning, Bruce and Kate discuss several things over breakfast: the strange energy surge, Bruce’s plans to use gamma rays to accelerate growth in crops and heal sick people, and the plight of the man who tried to assassinate the Hulk yesterday. Bruce is well aware of all the misery he caused in his former savage identity and has placed a call to a lawyer friend to see what can be done for the man. That evening, a dark shadow creeps into the dreamscape of Bruce Banner; a hulking silhouette which stalks the halls of the Baxter Building in search of its prey. It’s a monster of incalculable rage, and yet Sue Storm – the Invisible Woman – contains the creature with her powerful force sphere. With immeasurable strength and savagery, the beast destroys her invisible prison in the blink of an eye. As Sue falls, her brother, the Human Torch, comes to the rescue, only to be snuffed out in a deafening shockwave caused by the monster’s double handclap. Mr. Fantastic attempts to ensnare the intruder within the tangles of his hyper-stretching body, but the fiend responds with cold fury, tying him into a knot which painfully sends Reed Richards into unconsciousness. With his friends hurt and incapacitated, The Thing enters the fray to put a stop to the rampage. The monster offers nothing but a savage snarl, to which Grimm replies “Go ahead! Growl all ya want! See what it gets ya when the clock ticks around ta Clobberin’ Time!”. It is then that all hope vanishes as the beast unleashes a haymaker powerful enough to explode The Thing into a thousand small pieces of rubble! Finally, it breaks down the door to find Bruce Banner…reaching his bed…lifting him by his throat, and then…screaming awakes both Bruce and the woman he loves. Bruce’s own screaming, and the terror which caused it, were due to a monster he had thought vanquished – The Hulk. The next day, Bruce visits the man who tried to assassinate him, asking him the reason he wanted to kill the Hulk. The man, a bitter, defeated shell, returns the question, asking why the Hulk had to go and smash everything the man had. He proceeds to tell Banner of a nearby town named Hadleyville, where the man and his family lived years ago. When the Hulk came to Hadleyville, he brought along his war against the U.S. Army. In the aftermath of the battle, Hadleyville was destroyed and the Hulk leapt away. Insurance companies denied claims involving a gamma-irradiated monster, and the government was of minimal assistance, providing small trailer homes to the displaced residents. Without a job and devoid of hope, the man set to drinking and his wife left him, taking his kids along. Then, when it seemed things couldn’t get worse, he read in the newspaper that the Hulk had received a Presidential pardon. Despite all Banner’s efforts to make amends for his destruction as the Hulk, the lives of men like this remained destroyed. Banner feels responsible, of course, and attempts to drop the charges against the man. Unfortunately, the state prosecutor determines the charges against an attempted murderer, not the victim. Fortunately, however, Bruce Banner knows a very talented lawyer by the name of Matt Murdock (you may know him by his super-hero name, Daredevil: The Man Without Fear). Murdock is successful in persuading the state to drop the charges against the man, but the man has no idea where to go now that he is a free man. Kate Waynesboro greets him outside the courtroom, asking him to join her for a drive to Hadleyville. He agrees to come along, but wonders if this is “some kind of sick joke”, since Hadleyville doesn’t exist any more. When they finally arrive outside New York City to the suburban area where the man used to live, he is shocked to find that an entire town has appeared where there used to be only ruins. Freshly built houses, paved roads, vibrant trees and lush lawns stretch on for miles! And capping one of the final houses with a roof is none other than Bruce Banner, the Incredible Hulk! In a matter of weeks, Banner rebuilt the entire town using the power of the monster who haunts his dreams. The man is flabbergasted yet overjoyed at the gesture. With tears in his eyes, he thanks Banner for what he’s done, and finds himself filled with hope as he now has his town…his home…back. We are left to ponder his future where this unnamed man can now start the road back to rebuilding his life. It is a start, Banner thinks, to undoing the damage he caused back when the Hulk was a savage, unthinking monster. And as with any significant endeavor, the beginning only sets the stage for a long road ahead. It wasn’t a coincidence that Mantlo left the man unnamed in this story. He represents all the victims of the Hulk’s rage, as well as the great burden of guilt upon Banner’s shoulders for all the damage he can never undo. While this issue ends with a feel-good moment and a dose of redemption, we also know that it is only a drop in a very large ocean of obligation Banner owes to thousands of people before he can ever bee redeemed. The storytelling of Mantlo and Buscema was always a collaborative process, even though it remained true to the “Marvel Method”. Buscema shows true mastery in this issue, not only with the beauty of his pencils, but the placement of frames and the transitions between scenes. This particular issue means a great deal to me. Even though the most popular stories are the ones involving great battles, any issues where the Hulk experiences character-defining moments and touches somebody else’s life always have the most impact on me. That is why I chose this issue for my 50th column. I realize what a great privilege it is to share these stories with each of you, and Bill Mantlo taught me long ago the importance of giving whatever time and talent I can muster to make other people happy. I certainly hope you all have enjoyed the ride thus far and that you will continue to join me in this journey for the next 50 columns. Here’s to a lifetime of more great comics and more tasty coffee! Fare Thee Well! Incredible Hulk #293 is written by Bill Mantlo, penciled by Sal Buscema, inked by Gerry Talaoc, colored by Bob Sharen and lettered by Clem Robins with a cover by Bret Blevins.